The latest threat, which was announced by North Korean Foreign Minister Ri Yong Ho in New York, comes after the U.S.'s plan to impose new sanctions against financial institutions that do business with the rogue country. 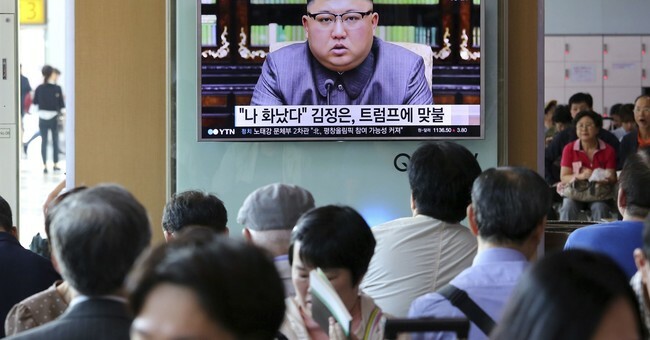 Ri said the decision on whether a detonation will occur will be made by Kim Jong Un. Responding to Trump’s speech earlier this week at the United Nations General Assembly, Kim said the president’s comments "convinced me, rather than frightening or stopping me, that the path I chose is correct and that it is the one I have to follow to the last." He also described Trump as a “mentally derange dotard” who would “pay dearly” for threatening to destroy his country if the U.S. had to defend itself or its allies. Earlier this month North Korea claimed to have successfully tested a hydrogen bomb that nuclear scientists estimated was nearly seven times more powerful than the bomb the U.S. dropped on Hiroshima, Japan, in 1945. Prior to that Pyongyang launched intercontinental ballistic missiles experts believe could have reached the continental United States. It also launched one test over Japanese territory. All of North Korea’s nuclear tests (six total) have thus far been underground. Detonating a hydrogen bomb above ground would undoubtedly escalate tensions, and not just with the U.S.
"If (North Korea) did, it would be condemned by everyone — the Chinese and the Russians would be just as upset as the U.S.," William McKinney, a scholar at the U.S.-Korea Institute of the Johns Hopkins School of Advanced International Studies, told Bloomberg. And if something goes wrong the consequences would be “truly terrifying” said Vipin Narang, a nuclear strategy expert at Massachusetts Institute of Technology.